Intertops Poker and Juicy Stakes Casino are spreading some Valentines Day love this weekend. 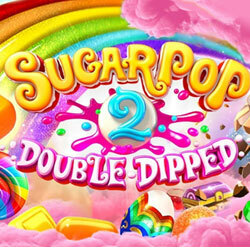 As a special Valentines treat, you can get 20 free spins on the new Sugar Pop 2: Double Dipped slot game. You only need to have made a previous deposit at the casino and you can claim your free spins February 14 -16. A sequel to one of Betsoft's most popular games ever, Sugar Pop 2: Double Dipped has everything you loved in the original -- like cluster wins and candies that explode in a cascade. But the new game has new features too, like a Morphing Golden Wild candy and a Jelly Bean Cannon. Clusters of a special Free Spin candy trigger Free Spins. Five or more explodes a Candy Bomb that clears a large portion of the board making way for massive wins. Intertops Poker and Juicy Stakes Casino welcome players from all over the world. They're known for their busy poker rooms on the Horizon Poker Network, but they also have a huge collection of slots and table games from Betsoft, Lucktap and Worldmatch in their casino games section. "Forget the sappy cards. And flowers are for funerals!" joked Intertops Poker's casino manager. "Show your love some sugar – play a little Sugar Pop 2 instead!"